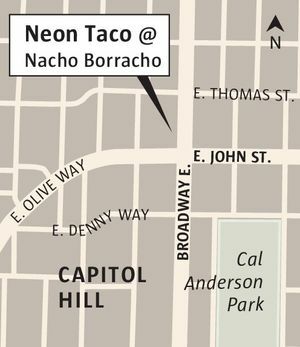 Mexican street food finds a home at Capitol Hill’s Nacho Boracho. This modest Mexican street-food, walk-up window marks the debut of chef Monica Dimas, who has done stints at Mkt., Spinasse and Monsoon, among other high-profile restaurants. Dimas rented the back kitchen space of Nacho Borracho in February and has been serving the barhopping crowd contemporary takes on tacos (turkey mole) and one of the best pork sandwiches on Capitol Hill. The menu: The food is Dimas’ spin on the taco-truck staples she grew up with in Yakima — handmade tortillas with fillers like briskets and pork rinds ($3-$4). Other offerings — quesadilla, torta and flautas — cost $8 to $10. The promising chef is off to Mexico City and Oaxaca this month for some R and D and plans to launch a full weekend brunch program and add some seasonal noshes in the evening, starting in May. What to write home about: Despite its name, the torta ($9) is the top billing — toasted bread stuffed with succulent chunks and strands of braised pork, fattened up with avocado and mayo and rounded out with pickled cabbage and jalapeños — a rich, salty and citrusy bite. That signature tomatillo carnitas — garlicky and peppery — also works well in a taco ($3) and on the nachos ($10). The mole in the turkey taco ($3) is more nuanced, not too chocolate-y or Tex-Mex-y. What to skip: The “totchos,” tater tots topped with nacho fixings, can only be justified in an inebriated state. The setting: Order from the Neon Taco’s walk-up window toward the back but eat in the Nacho Borracho bar area. If this setup sounds familiar, it’s because the investors behind Nacho Borracho struck a similar deal at their other dive bar, Montana, where you order food from the window of Kedai Makan, an Asian street-food shack. Summing up: Five tacos, a totchos, flautas and torta totaled $48.22 including tax, enough food for two to three people.